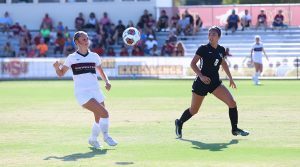 With a win of 2-1 during overtime, the women’s soccer team defeated New Mexico Highlands on Aug. 30. The team also opened with a newly appointed head coach, Ryan Spence, graduate assistant coach for men’s soccer in 2014. While Spence said he was satisfied with the opening game’s outcome and said a win is a win, there is still something the team can improve on: not getting scored on. “We gave up a really bad goal that should’ve never happened so that’s not what a shut out needs to be,” Spence said. Amaya Spearman, Rider High School senior who attended to support a friend, had similar views. “I was nervous that they weren’t gonna get a goal but they ended up getting one so it was awesome,” Spearman said. Spearman also heard about the game through social media and her soccer coach at Rider. 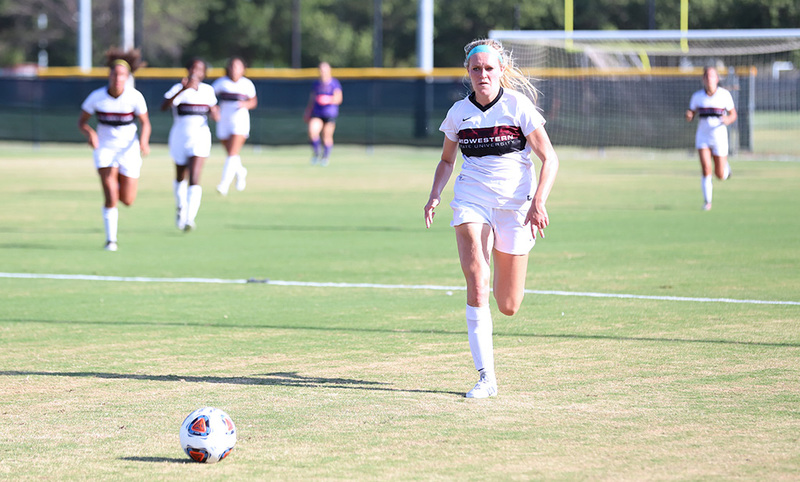 “I saw it on social media and I heard it from my soccer coach at rider because there is a group that we use to play with at rider,” Spearman said. “Being able to come out here with my soccer friends and watching a former soccer player 31, Emma Baley playing soccer and we were cheering her on; it was just really fun. Demian Ponce, mass communication sophomore, also attended to support a friend and like the game’s outcome. “Well, we won, and my favorite player Madi scored so I’m happy how it turned out,” Ponce said.